I made this thank you card for the color and sketch challenges on Just Rite and The Shabby Tea Room. It's a 5x7 card with light blue and peach and a little red. 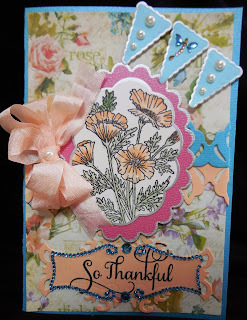 All the dies are Spellbinders dies and the pretty poppy stamp is from Just Rite and I colored it with peach copics. I added some peach ribbon and bling to the sentiment die. The sentiment is from Just Rite Good friends label twenty nine. I added the little flags with some bling to finish the card. Very pretty card. I love the stamp. Your card is just lovely- I adore the bling you added too! your card is lovely great color choice nice and soft colors looks like your ready for spring. This is lovely, Karen!! Soft colours and so beautifully embellished card. Very pretty. Love the bow.